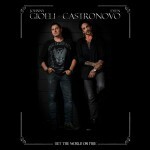 Share the post "Album review: GIOELI CASTRONOVO- Set the World on Fire"
Frontiers latest all-star combination reunites two members of Hardline- singer Johnny Gioeli, the one constant in their line up to the present day, and drummer Deen Castronovo who played on their debut, in between his service with Bad English and Journey, before his own vocal talents belatedly came to light, latterly being given full reign with Revolution Saints. With the omnipresent Alessandro Delvecchio on board as primary songwriter and producer, it is hardly surprising that the sound owes much to their parent bands, given his own involvement with them. Rather disappointingly though neither singer plays any part in the writing. The title track get the album off to a great start as a stirring, anthemic rocker in which Deen sings the verse with his Perry –influenced smother, higher tones before Johnny’s raspier voice kicks in on the pre-chorus . However only on about two thirds of the songs do the two actually duet, and there is no fixed format as to how they combine. The goodies come thick and fast with ‘Through’, pitched somewhere between Bon Jovi and Journey, very melodic with a strong chorus filled with insidious hooks and, though slightly mellower, ‘Who I Am’ and ‘Fall Like an Angel’ also have good choruses. The production places the vocals front and centre, but other than some tasteful guitar solos from another Frontiers staple Mario Percudani, the instrumentation is buried in the mix almost as an afterthought. A third voice is added to the mix, Georgia Colleluori duetting with Johnny on a surprise cover of Lady Antebellum’s ‘Need You Now’ which is a ubiquitous sound on American car radios and in shopping malls. It’s fairly faithful to the original but the purpose is unclear other than to compare unfavourably with the home grown songwriting. More conventionally, ‘Ride of Your Life’ is a Jim Peterik song and has the hallmarks of his dramatic style, sounding like Survivor crossed with Journey although Deen’s voice sounds a bit high-pitched and thin for the song. Unfortunately there is something of a dip in quality later, with too many songs coming over like a generic Journey pastiche and Johnny sounding rather marginal. After back to back ballads in ‘Mother’ and ‘Walk with Me’, ‘Run for Your Life’, a co-write from Brit AOR stars Steve Overland and Nigel Bailey is refreshingly uptempo despite the similarity in title to one only three songs before. There were very high expectations for this album which invariably will divide opinion: it certainly misses a few opportunities and is ballad heavy, but the first four or five songs were outstanding pieces of melodic hard rock. This entry was posted in ALBUM REVIEWS, ALBUM REVIEWS (Mobile), All Posts and tagged album, Alessandro Delvecchio, AOR, Deen Castronovo, Hardline, Johnny Gioeli, melodic rock. Bookmark the permalink.